You will not get a better placed hotel on the island. You are situated in a rural location amongst the hills, with the added bonus of a good pool and views that are absolutely stunning! The hotel has limited facilities, relying on solar panels for hot water. Service can be slow, English can be limited and breakfast basic. Because of the hotels rural location, guests will need to take a taxi if they wish to eat in local restaurants. 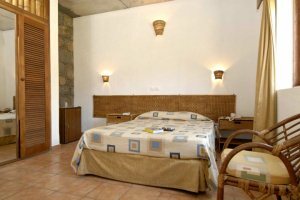 Pedracin Village is a delightfully quiet and unique holiday hideaway retreat, elevated on a steep mountainside and benefiting from spectacular views of Santo Antão’s impressive green landscape. The swimming pool is ideal for a quick dip to cool off, while the surrounding terrace boasts amazing views down the valley – the perfect place to relax with a cold drink or a good book. Pedracin Village offers 20, traditional and basic style bungalow rooms, linked by cobbled pathways which meander through the property’s tropical grounds. This hotel has limited facilities, relying on solar panels for its hot water and serving basic breakfast, lunch and dinner choices from the restaurant located next to the pool. The hotel is located on the north side of the island, and guests will experience a wonderful drive across the interior of Santo Antão to reach Pedracin. The island’s largest town of Ribeira Grande is a 10-minute drive away, with its cobbled streets and typical Cape Verdean architecture. A stay at Pedracin Village offers a great opportunity to experience this wonderful island and is particularly popular with avid walkers. Direct International flights to Sal, then internal flights to/from São Vicente plus a one-hour ferry to/from Santo Antão. Santo Antão is best experienced as part of a multi-centre island hopping holiday around the archipelago. Call one of our experts about a tailormade itinerary. Travelling time between Sal and São Vicente is approximately 45 minutes flying time. Followed by a 1 hour ferry journey from Mindelo (São Vicente) to Porto Novo (Santo Antão). 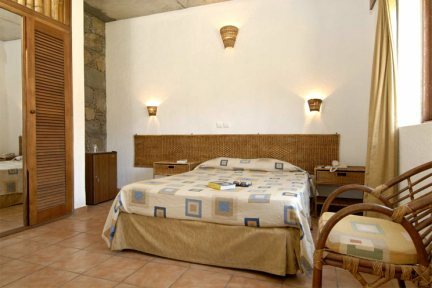 Twin or double bedded rooms feature a character stone wall. There is a walkway outside rooms which has shared log seating.